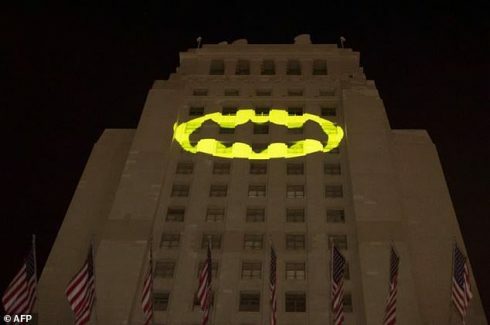 A giant Bat-signal lit up the side of City Hall in Los Angeles Thursday night to honor Batman actor Adam West, who played the superhero role in the 1960s television series. He died on Friday at age 88 following a battle with leukemia. The caped crusader helped protect the fictional Gotham City in a franchise that began as a DC Comics strip before also moving to television and film. When Gotham’s authorities needed Batman’s help, they projected a light beam with his logo into the sky. Los Angeles Mayor Eric Garcetti and police chief Charlie Beck led Thursday’s tribute. Hundreds of fans thronged the ceremony, many dressed up in costumes from the television series and films. Clark Gable III (above), the grandson and namesake of the late Hollywood screen star, was stabbed in the rib cage during a fight at a party in Calabasas, Calif.
TMZ reported Tuesday Gable was hospitalized for a week and treated for a lung injury sustained in the brawl last month. His age, occupation and release date from the hospital were not mentioned in the report. One suspect has been arrested and police are looking for a second in connection with stabbing, the entertainment news Web site said. The fight reportedly involved several party guests and started after Gable allegedly insulted someone. His grandfather starred in film classics such as “It Happened One Night,” “Gone with the Wind” and “The Misfits.” He died of a heart attack in 1960 at the age of 59. Blogger and entertainment writer, Andre Soares of the Alternative Film Guide, writes about the recent Outfest statements by directors Todd Holland and Don Roos, on whether gay actors should stay “in the closet.” A brief snippet is included here. To read the entire article, please click on the link below.